They were disenfranchised in two ways. Firstly, they have no say in the running of their club. Instead, it is sold off like a piece of meat. I don’t know a single Liverpool supporter who wants the club owned by Hicks and Gillett, and there are several campaigns to get rid of them, such as Spirit of Shankly and Share Liverpool. But it doesn’t matter what we think. LFC is now just a commodity to be bought and sold between rich men seeking an investment or a plaything. Secondly, many fans, especially children, are disenfranchised from even entering the ground. Ticket prices are now so expensive in the Premier League that an entire generation has been raised by TV football rather than the real thing. The average age of a Premiership fan is 43 years old. Bald or greying heads are in abundance at any Premier League ground. Going to the match is now something that you save up for, not something that is a given part of the rhythm of your daily life. The poorest in Liverpool huddle together in pubs to watch their team, broadcast illegally on Scandinavian or Arabic TV channels. Even in the 80s when unemployment in the city was rife, people went to the match. At times, it felt like the match was all we had. Yet in Germany, there is a different story. Clubs in the German Bundesliga (their top flight league) are by rule owned and controlled by their members, and cannot be taken over by private investors. This rule has just been overwhelmingly affirmed. Even the mighty Bayern Munich must have over 50% of its control in the hands of its members. As a result, ticket prices are low. Young fans can get to watch games in the flesh than via Rupert Murdoch’s Sky. Attendances are among the highest in Europe. Some may argue that such a system can’t compete with the huge private investors that are pumping money into English clubs. Nonetheless Bayern Munich remains one of the giants of European football. In the last 10 years it has appeared in 2 Champions League finals, winning one of them. More than Roman Abromavich’s Chelsea team have done. But that aside, the core of any football season, here or abroad, is the domestic league. Europe is a recently added cherry on the cake. Given a thriving domestic league that fans can actually attend and feel a genuine connection to their club, who would sacrifice that for the ability to be competitive in Europe. The German model is one to be cherished and used as a template for winning back our game from the money men here. Part of that movement is happening in the lower leagues, where fans of clubs like Wimbledon, Manchester United, and Liverpool have turned their back on the Premiership in favour of creating a club that they themselves own. 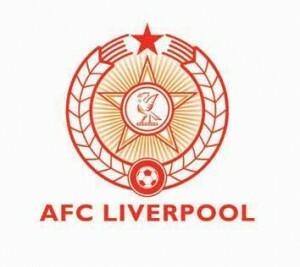 AFC Wimbledon, FC United of Manchester, and AFC Liverpool are the seeds of a movement that calls upon football fans to return to our roots, and never again allow the stench of oligarchs and money to steal our football teams from us. This is my official AFC Liverpool cup final song for last season’s cup final. For the record, we won it! Spot on again, Al. The reason I’m living on Merseyside now is because away back around 1970 I was a Liverpool fan in my native Derry and saw an advert in a magazine from a girl in Clubmoor looking for an Irish penpal. We became firm friends and are now partners. But we can’t get into Liverpool games (perhaps the odd Carling Cup or charity game), so the thing that originally brought us together as teenagers is now denied us. That’s why we support AFC.